Carcinoma cuniculatum (CC) is a rare, distinct clinicopathological subtype of squamous cell carcinoma, with fewer than fifty cases reported in English literature. It is characterized by a complex pattern of stratified squamous epithelium without atypia, often having exogenous and endogenous components. Although it associated with a good prognosis, it is more locally aggressive than verrucous carcinoma, a close differential diagnosis, and needs to be understood as a distinct entity for appropriate treatment. We present our experience of two cases and a review of literature. A 71-year-old male with no known comorbidities, prior illness, or history of substance abuse presented with complaints of a painful ulcerative lesion on the left side of tongue, noticed a year ago. Multiple biopsies were done from the lesion, which were all inconclusive. He developed a swelling in the left submandibular region diagnosed as chronic submandibular sialadenitis, with excision of the gland. Ten days later, he noticed purulent discharge from the operated site associated with severe pain. The histopathology of the excised submandibular gland was unremarkable. Clinically, he had mild trismus and a tender nodule 1 cm × 1.5 cm in size in the left retromolar trigone with diffuse tenderness in adjacent tongue and tonsillar fossa [Figure 1]. 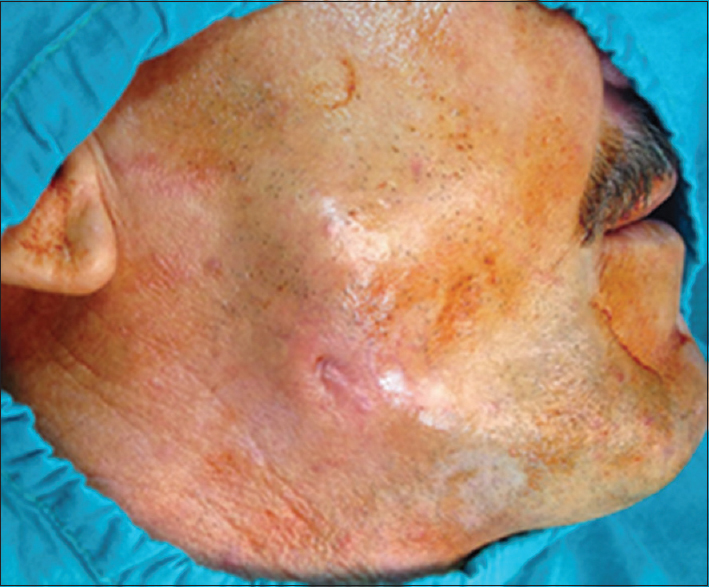 He also had moderate seropurulent discharge from the left submandibular surgical site. 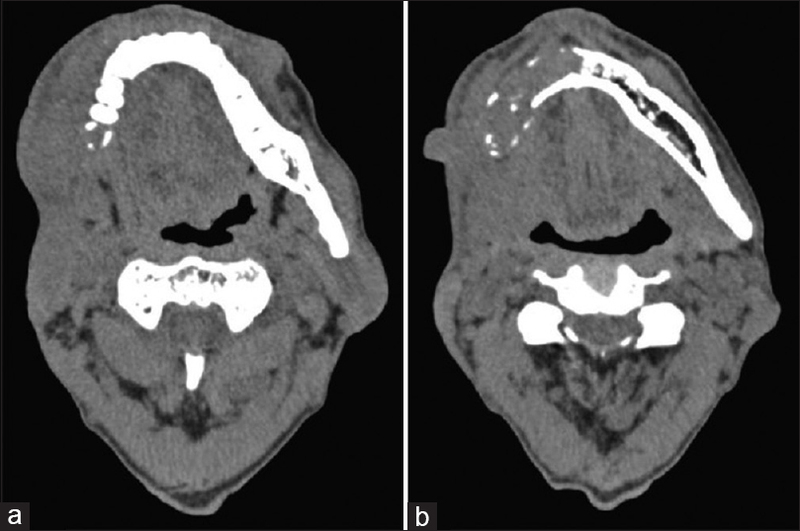 On imaging, a contrast-enhanced computed tomography (CT) of the head and neck revealed a soft-tissue thickening along the left wall of oropharynx, tonsillar fossa, and adjacent left lateral border of oral tongue, with poor fat plane with submandibular space [Figure 2]. Superiorly, the lesion was extending up to the soft palate and retromolar trigone with ill-defined suspicious erosion of adjacent palate. He underwent examination under anesthesia and frozen section biopsies. Induration was appreciated in the retromolar trigone nodule, adjacent posterior third of the tongue, and left tonsillar fossa. Multiple deep biopsies were inconclusive on frozen section, following which a tonsillectomy was performed for a histological diagnosis. The tonsil specimen showed CC and was verified by two pathologists. In view of the extent of the oral tongue involved, he underwent subtotal glossectomy with left marginal mandibulectomy, bilateral selective neck dissection (Levels I–IV), and anterolateral thigh free flap reconstruction. His histopathology was reported as CC of the tongue T4N1 with negative margins. He received postoperative radiation of 66 Gy. Four months later, he complained of repeated pain and was found to have some fullness below the reconstructed flap, for which a positron emission tomography-CT was ordered. He had an extensive local recurrence; the multidisciplinary tumor board found him unsuitable for any curative intent therapy, and he was started on oral metronomic chemotherapy. A 63-year-old male, with no known comorbidities, prior illness, or history of substance abuse, was referred to us with swelling in right ramus of mandible for 6 months. It was diagnosed as odontogenic keratocyst, and he underwent curettage and marsupialization of the same elsewhere. He had a recurrence of the lesion within 2 months and underwent repeat curettage and chemical cauterization with minimal improvement in symptoms, followed by incision and drainage. His symptoms progressively worsened; he had associated pain and trismus. Enucleation of the lesion was performed, and he was referred to us with a discharging sinus for further management. He was found to have two discharging sinuses in the right cheek with granulomatous discharge. Right cheek and parotid region were found to be inflamed, with tenderness [Figure 3]. Bone sequestrum was expressed on applying pressure, with discharge draining in the right retromolar region. He had mild trismus and no palpable cervical lymphadenopathy. 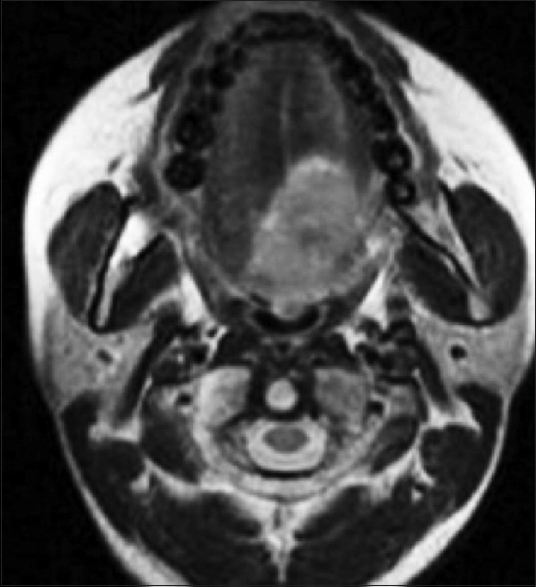 An ill-defined soft tissue of 4 cm × 5.7 cm with gross adjacent fat stranding was noted, involving the adjacent soft tissue with two sinuses extending up to skin surface [Figure 4]. There were multiple enlarged right level II cervical lymph nodes, the largest measuring about 12 mm. He underwent a right segmental mandibulectomy and anterolateral thigh flap reconstruction. His surgical histopathology was reported as carcinoma CC of the alveolus, staged T4N0 with negative margins. He underwent postoperative radiotherapy of 66 Gy. He has been on regular follow-up, and at 1-year posttreatment, he was disease free with no complaints. CC is a fairly recent entity, with the first case in the oral cavity being described in 1977. It is a well-differentiated variant of squamous cell carcinoma with a notable lack of cytological atypia,, which may be the reason it is often not recognized immediately as malignancy. In our cases, as well as others in literature,, these patients often require repeated biopsies and have a significant delay in diagnosis. The pathognomonic feature is infiltration of the underlying stroma by invasive stratified squamous cells in the shape of complex crypts appearing like rabbit burrows, from which its name is derived (Cuniculus is the Latin term for rabbit). Our first case was an unusually aggressive presentation; none of the other reports ,,,,,,,,, showed a recurrence after complete treatment. This made us doubt the diagnosis and review the slides; however, the diagnosis was confirmed; a local recurrence rather than a metastatic presentation also conforms to the pattern of locally aggressive CC. The exact etiology of this disorder is unknown. Recent studies have shown that CC has higher expression of E-cadherin, integrin α6, and laminin 5γ2 when compared to squamous cell carcinoma and verrucous carcinoma, suggesting that it has a distinct molecular origin and biological behavior. Given the rarity of the diagnosis and the indolent behavior of the tumor, it is often mistaken for other conditions such as verrucous carcinoma, pseudoepitheliomatous hyperplasia, odontogenic keratocysts, or osteomyelitis. Although it is considered an indolent form of squamous cell carcinoma in general, CC has a more aggressive clinical course when compared to verrucous carcinoma , and hence this distinction needs to be made. CC is an unusual occurrence, but awareness of the diagnosis is mandatory to avoid diagnostic delay; many of these patients are not diagnosed with malignancy and do not receive appropriate treatment earlier on. Multiple deep biopsies are likely to provide adequate tissue samples, along with detailed sectioning by the pathologists to avoid missing small areas of atypia or focal invasion which would help establish the diagnosis of malignancy. Although likely to be less aggressive than squamous cell carcinoma, there is no evidence supporting any deviation from standard treatment protocols. Flieger S, Owiński T. Epithelioma cuniculatum an unusual form of mouth and jaw neoplasm. Czas Stomatol 1977;30:395-401. Datar UV, Kale A, Mane D. Oral carcinoma cuniculatum: A new entity in the clinicopathological spectrum of oral squamous cell carcinoma. J Clin Diagn Res 2017;11:ZD37-9. Padilla RJ, Murrah VA. Carcinoma cuniculatum of the oral mucosa: A potentially underdiagnosed entity in the absence of clinical correlation. Oral Surg Oral Med Oral Pathol Oral Radiol 2014;118:684-93. Suzuki J, Hashimoto S, Watanabe K, Takahashi K, Usubuchi H, Suzuki H, et al. Carcinoma cuniculatum mimicking leukoplakia of the mandibular gingiva. Auris Nasus Larynx 2012;39:321-5. Fonseca FP, Pontes HA, Pontes FS, de Carvalho PL, Sena-Filho M, Jorge J, et al. Oral carcinoma cuniculatum: Two cases illustrative of a diagnostic challenge. Oral Surg Oral Med Oral Pathol Oral Radiol 2013;116:457-63. Thavaraj S, Cobb A, Kalavrezos N, Beale T, Walker DM, Jay A, et al. Carcinoma cuniculatum arising in the tongue. Head Neck Pathol 2012;6:130-4. Sun Y, Kuyama K, Burkhardt A, Yamamoto H. An immunohistochemical study of oral carcinoma cuniculatum. Int J Oral Med Sci 2012b; 10:333-43. Allon D, Kaplan I, Manor R, Calderon S. Carcinoma cuniculatum of the jaw: A rare variant of oral carcinoma. Oral Surg Oral Med Oral Pathol Oral Radiol Endod 2002;94:601-8. Johnson N. Squamous cell carcinoma. Head and Neck Tumours, Pathology and Genetics 2005:168-75. Huault M, Laroche C, Levy J, Laxenaire A, Roucayrol AM, Scheffer P, et al. Epithelioma cuniculatum. Apropos of a case in the anterior gingiva with involvement of the mandibular symphyseal bone and reconstruction using a fibular osteocutaneous flap and integrated implants. Rev Stomatol Chir Maxillofac 1998;99:143-8.